It seizes its pray with its rapidly extending jaws – which can be used to swallow large fish with one bite. The glow-in-the-dark beast is so incredibly rare that only a handful have been caught since they were first discovered in 1986. Because they are so seldom seen, little is known about viper sharks =- but they’re believed to migrate from 300m-400m deep during the day to 150m deep at night. 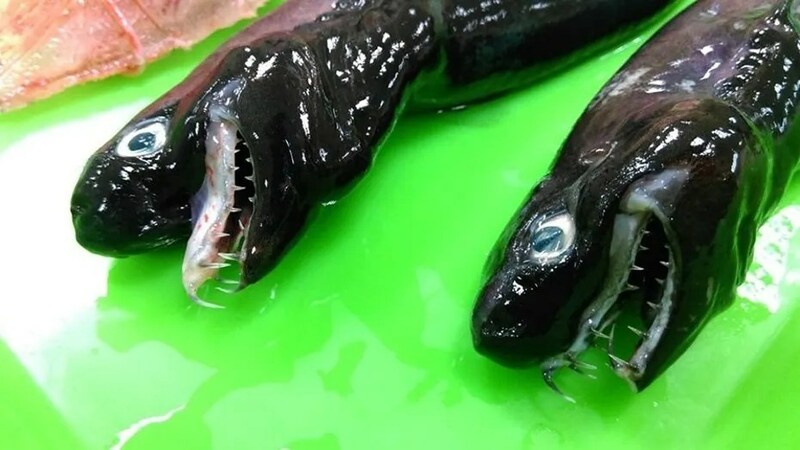 Of the latest specimens – which were caught at a depth of 350m – four were dead and the living shark was immersed in cool seawater, but died a day later. The viper shark diet comprises crustaceans and bony fishes, including lanternfishes – perhaps attracted by the predator’s glowing body. The species was first discovered in 1986 off the coast of Shikoku Island, Japan, by the bottom-trawler, Seiryo-Maru. Its scientific name Trigonognathus kabeyai honours the fishing vessel’s captain, Hiromichi Kabeya.